This Sunday the Greek people will go to the polls in an election that could see the beginning of the end of austerity in Europe. That anyway is the view of some on the left across Europe. The potential election of a Coalition of the Radical Left (Syriza) Government, promising a radical reduction in the debt burden, has the potential to galvanise and set an example to the rest of the PIIGS. It could incite a combined movement in Portugal, Ireland, Italy, Greece and Spain that would reduce the debt of these countries which has been a prime driver of austerity. Through radically reducing the requirement to service and pay down enormous debts such a step could launch a definitive movement away from neoliberalism towards a radically different Keynesian social democratic alternative. The elections in Greece will be followed this year by elections in Spain, in which a like-minded Podemos movement has grown, and in Portugal, and may also be joined by an election in Ireland despite the claims of the current Government that it will run in office until 2016. Of the five PIIGS therefore at least three and possibly four may see elections this year. Even elections in Britain could see the ousting of the Tory devotees of austerity and neoliberalism. In fact the policy that might inspire the PIIGS is not confined to them but might apply right across Europe. And Syriza is in the vanguard of this movement. Is such a scenario a real possibility? Let us notice what makes such a claim plausible. Firstly the proposals of Syriza are not solely on behalf of the Greek people although as a Government it will be able to negotiate only on their behalf. Syriza proposes a European Debt Conference modelled, with delicious irony, on effective debt forgiveness of (West) Germany in 1952. This was carried out explicitly in order, or so it was claimed, to normalise relations between Germany and its creditors and to promote economic development. That deal wrote off half of the debt, stretched repayment of the rest and for the first few years provided only for payment of interest, which was also limited. Syriza proposals are more limited. Their policy could be based on an academic paper which proposes that half of the debt would be bought up by the European Central Bank (ECB) with either an interest holiday or interest charged on the remaining debt at a low rate. The debt taken on by the ECB would not be written off but would be paid back only when the remaining debt left to the country had been reduced to 20 per cent of Gross Domestic Product (GDP). In effect economic growth and inflation will have eroded the real value and real impact of debt repayment. It has been estimated that this would reduce sovereign debt in the Eurozone area by about €4.5 trillion. It is asserted that this would not risk inflation because the ECB debt purchases would be funded by massive borrowing from private banks. There would be no money printing since the money is borrowed. And sure why worry about inflation when deflation is so clearly the enemy? And who pays the interest on these loans? Well, it is recognised that there will be losses in paying back the private banks, between €50bn – €60bn in each of the first 5 years, and €1trilion over 40 years, but it is argued that the borrowing costs of the ECB would be low and that renewed economic growth would compensate. It would be cheaper than the current policy of austerity and expansion of the ECB balance sheet required to bail out the banks. It is recognised that this may not be enough in the short term for some countries so that, for example, in order to prevent continued austerity in Greece the ECB would have to take over the debt that would be required to be issued in the next five years. This would also be required because over 50% of outstanding debt has to be paid back within the next 5 years in Italy, Spain, France, Holland and Belgium and to cover this new debts would have to be taken on. For Marxists the point is not that some monetary scheme has been devised that will solve capitalisms’ problems. Nor is it the point that Syriza will go into negotiations and cannot expect, as in all negotiations, to get its original plan agreed, even discounting some conscious intention to betray the hopes of its supporters in order to accept the logic of capitalism. The significance of the proposals is that it provides a concrete platform around which workers across Europe can organise and struggle together, and a series of elections that can be a focus for such struggle. This is not to invest illusions in either elections or Syriza, who are condemned by some for having shifted from a policy of debt repudiation to one of simply extending repayment under more favourable terms. If a practice of simply condemning the limitations of reformist politics were the answer we would no longer have the problem. The Syriza programme is one that workers and socialists can support because it reduces the burdens they face and would deal a big political and ideological blow to austerity and the parties who have peddled it. It would deal a real blow to reactionary political parties seeking nationalist or fascist solutions. Through a successful campaign workers could gain strength and confidence to build up their organisations, their own social and political power and their own confidence and class consciousness. The latter is the role that Marxists can play by advancing a programme that does all these things. This is made tactically easier by Syriza not proposing either to leave the Euro or leave the EU. There can be no pretext that the demands of Syriza can be dismissed because they no longer want to belong to the club. These policies have been condemned as examples of betrayal of earlier more radical promise but they are not just tactically recommended. 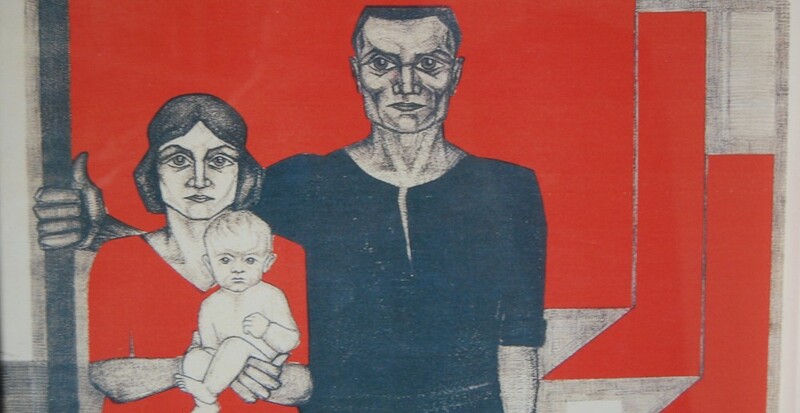 As argued before in the various posts on ‘The Left Against Europe’, the growing unity of capitalism provides the material basis for the international unity of the working class. This is why a united international struggle against austerity is more immediately and concretely possible in the Eurozone than one against similar policies pursued more or less independently by separate capitalist states each with their own currency. So to return to our question – is such a scenario possible? It is possible to argue that it is, for the simple reason that the Greek debt is too big to be paid back anyway. Some means of addressing it is required and the Syriza route is eminently preferable for workers than the slow death march of austerity and repeated minor debt ‘haircut’ so far embarked upon. The second is that by the very fact that the Syriza plan is reformist there is no necessity for a life and death struggle by the forces of capitalism to defeat it. The Syriza plans do not call the system into question, which both sets limits to what it can achieve but also provides scope for negotiations between a Syriza Government (and other PIIIGS Governments should they be elected or so inclined) and the IMF/ECB /EU/German State alliance. The rallying of the Greek workers behind Syriza is one of many proofs that a revolutionary overthrow of Greek capitalism is not currently on the cards and is not therefore a realistic immediate alternative. The revolutionary alternative today consists of preparing for such an eventuality tomorrow. Not by either passively or even ‘aggressively’ preparing for socialist revolution but by the cumulative development of the power of the working class suggested above, with the certain knowledge that a revolutionary break with the capitalist state and system will be required. To condemn Syriza for negotiating with capitalism when it cannot be overthrown is a bit like condemning trade unions for negotiating a pay award when they should be overthrowing the wages system. The third has been pointed out here – Syriza will be damned if it does not get some sort of result and the executor of that judgement may be the fascists of New Dawn. It is not only Syriza who has an interest in ensuring this doesn’t happen. 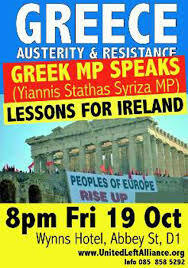 ‘Ireland is not Greece’ we have been told repeatedly over the past five years or so. If Syriza is anyway half successful Ireland will look pretty stupid if it isn’t. This entry was posted in Debt, European Union, Greece, Syriza and tagged Austerity, Crises, Debt, Debt Default, European Union, Greece, Syriza by irishmarxism. Bookmark the permalink. I don’t know how serious a socialist outfit Syriza really is. It is pretty scary to open the 5 feb issue of anphoblacht to find Syriza MEP’s and Podemos MEP’s, posing all smiley faces with two Sinn Fein bureaucrats under the headline banner and article ‘Mep’s support for Peace Process and implementing of the Stormont House Agreement’. The article boasts how Europe’s new radical left applauds their own latest breakthrough. The arch deceivers of Sinn Fein have found yet another propaganda ploy: we are the Syriza of Ireland come along and support us at the ballot box. What is even more scary, a heck of people on the Irish left who should know better are preparing the working class to believe in the crap. Build a left alternative in Ireland with Sinn Fein as the main anchor, my worst nightmare coming true!